Kāwelu is one of the top restoration plants in the Kure nursery and one of the few native kinds of grass being restored on Kure. It has been a great infiltrator to areas where non-native grasses once existed. dipping, rippling and swaying the breeze. It is mentioned in many chants and poems. Prior to 2006, kāwelu was rare with maybe about 100 plants remaining. Cloning those last 100 for large-scale outplanting operations began by breaking off clumps and propagating them in the nursery or directly outplanting them into new areas. After a decade of successful outplanting efforts from 2006-2016, there is enough kāwelu around the central parts of the island that this grass is only propagated in the Kure nursery for outplanting in the dunes, runway and north point. Kāwelu is present on other Northwestern Hawaiian Islands but Kure has continued to use their own seeds. To which there may be significant growth differences that separate the strain on Kure from the others. 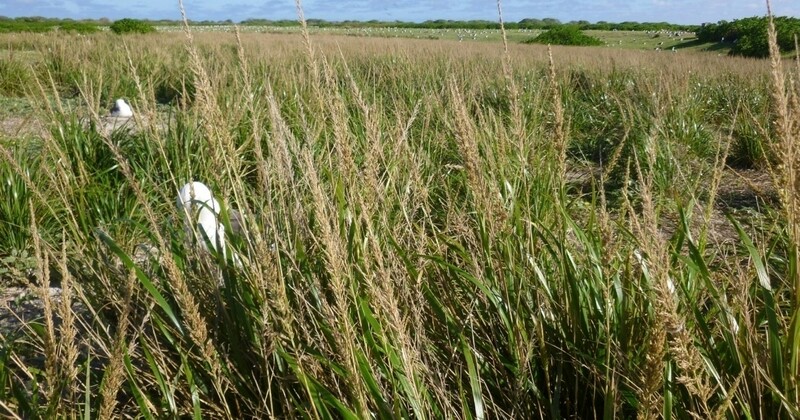 Primarily, the kāwelu grass is smaller on Kure in comparison to the kāwelu on Midway and Laysan Island. Kāwelu has been an ideal candidate for mitigating erosion and increasing nesting habitats due to itʻs extensive root structure and low die-back rate. When it does die-back, itʻs a little brown but overall a very drought-resistant plant. Even a dead kāwelu plant continues to provide years of habitat for burrowing birds and shelter from sandstorms with the high volume of material left and strong root structures.